There’s a chill in the air and frost on the ground now, a sure sign that Winter’s really arrived. Despite the temptation to stay indoors when the temperature plummets, provided you’re well wrapped up against the cold, going outdoors to enjoy walking on a bright crisp day can be very refreshing, especially if you can find a real log fire to warm up in front of afterwards. It’s worth trying any walk in different seasons to see the changes that nature brings. Walks by rivers and canals are idyllic in the summer, but can be equally rewarding in the winter. The lack of leaf cover means you often get a glimpse of animals that you wouldn’t normally see during the daytime. Keep your eyes open for foxes and deer, foraging for food around the fields and hedgerows. The sparseness of the foliage also reveals birds that don’t need to migrate for the winter. Look out near water for the grey-backed, yellow-bellied Grey Wagtail, quite often mistaken for the green-backed Yellow Wagtail (which will have left for the warmer climes of Africa by now). You could walk through Reading along the Kennet and Avon canal from where it meets the River Thames at the Kennet Mouth. The entire canal runs for 86½ miles and 100 locks from the Thames to the Severn Estuary near Bristol. Designed by an engineer called John Rennie and originally opened in 1810, it was profitable for its first thirty years until the Great Western Railway opened from London to Bristol in 1841 and proved to be too much competition. The canal’s decline continued until the 1950s, when the state of some of the locks became so poor that parts of the waterway had to be closed. The canal and towpath, which you can now follow it along was only fully repaired and reopened in 1990 after being derelict for years. This walk covers about 6-10 miles each way, dependant on where you turn around. You could start right in the town centre, where the canal runs along front of the Oracle shopping centre. Alternatively, pick the towpath up under the road bridge (bridge number 8) near the end of Rose Kiln Lane, just before it meets the A33 (the Reading Relief Road) and follow the cycle path signs for Newbury. The towpath runs north of the waterway until it crosses the weir at Fobney Lock bridge (bridge number 9 and lock number 105) by Fobney Pumping station, built in the 1870s to serve the town with clean water. During the canal’s heyday, these banks were once lined with busy wharves but now all is quiet. From here we leave housing and business behind, passing through open countryside where the floodplains to the west of Reading have kept development away from the canal. The towpath follows south of the canal under the railway line at Southcote Railway Bridge (11) where the weir runs down in fingers until it reaches the Milkmaids Footbridge (12) and Southcote Lock (104). Here the path splits and one route runs along the top of the gravel pits that now house various water-ski and jet-ski clubs. Stay on the towpath along the main canal and you’ll come to an stretch of river where many colourful narrowboats are moored, just before passing underneath Burghfield Bridge (14). Here you could hire a boat, or take a trip right back to your starting point in the summer. However, as its Winter, you may feel in need of a warm, so the sight of The Cunning Man pub will probably be a welcome one. The pub was named after a local wizard called the 'Cunning Man of Tadley', who people would travel from Hampshire to consult with (for payment) about thefts or potential lovers in the 1800s. It has open fires and warming meals and is very child-friendly. Further along, past Burghfield Farm, Swan's Bridge (15) takes the towpath back over to the north of the canal at Burghfield Lock (103), otherwise staying on the footpath to the south would lead towards Burghfield Mill. Further west, the route passes another weir before reaching Hissey's Bridge (17) where the route passes south of the canal once again. Here the footpath leading directly south goes to the picturesque Moatlands Cottages, where you could loop back around to the pub along Mill Road. Alternativelly, if you fancy a slightly longer walk, follow the canal under the M4 motorway bridge (18) and past the next two locks. The towpath runs right along the edge of the gravel pits at Garston Lock (102), providing a good vantage point to see the colourful sails of the windsurfers and boats brave enough to risk the cold, or to watch gulls coming in to roost on the water in the early evening. Just after Sheffield Lock (101), the canal meets Theale Swing Bridge (19) near Theale railway station. Here you could carry on past the Mill to Sulhamstead Lock (100) and Sulhamstead Cut Swing Bridge (21), but bearing in mind the cold and the shorter days, you could decide to turn around here and walk the short distance south along Station Road, past the car park toward Sheffield Bottom. Here you’ll be rewarded with a second hostelry, the Fox and Hounds at Sunnyside which also has good food and open fires, and real ale and jazz if you turn up at the right times. To head home, either retrace your steps, or if you don’t mind walking along a road, follow Station Road for about a mile along the southern edge of the gravel pits, passed James’s Copse and Bennettshill Copse until you meet the public footpath crossing the road, just before the motorway services. Take this footpath across the motorway to Moatlands Cottages and then Mill Road to take you back to the canal at Burghfield Farm. 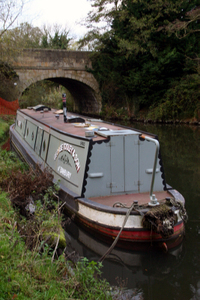 You can download maps of this route from the Kennet and Avon Canal Trust at http://www.katrust.org/reading/reading2.html.